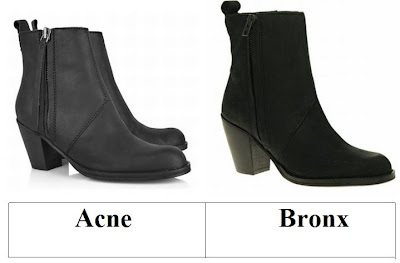 Mon doux, in the left corner you will find Acne’s celebrity-adored Pistol Short Leather Boots – the very same ones seen gracing the fancy feet of Keira Knightley, Clémence Poésy, and Rachel Weisz; in the right corner take a peek at Bronx’s perfectly similar Zip Heeled Ankle Boot. Though the Bronx beauty features a slightly higher shaft and a color that is more matte than that seen upon its Acne counterpart; for just $215.64, in comparison to the $560.00 needed to snag a pair of le pretty Pistol; they are every bit as capable of firing up one’s wardrobe – at a price that no fashion-forward frugalista can resist! i'd have to go for the acne ones, they're growing on me! As long as I could water proof those babies, I'd definitely go for the cheaper ones. Perfect for winter here. Yeah for a steal! Hope you have a Fun Halloween! These are a must have for winter. I'm glad you found a steal! Cute boots - can't choose! The bronx all the way! Love the style of the boots. I need those Acne ones. I love the boots, I need a pair like that! I'm liking the Acne version better I think! Not my style, but a good deal nonetheless. I love the steal ones! :) Happy Halloween my dear! I actually prefer the look of the more xpensive model. And as long as they both feel comfortably the same, I wood bee willing to pay the Xtra $$. Gotta go with the Acne ones -- adorable! oooo, cheaper for me please! I like the higher heel. I love the right ones! these are pretty much exactly the same, besides from the stitching the pistols have. I have these shoes and LOVE them.